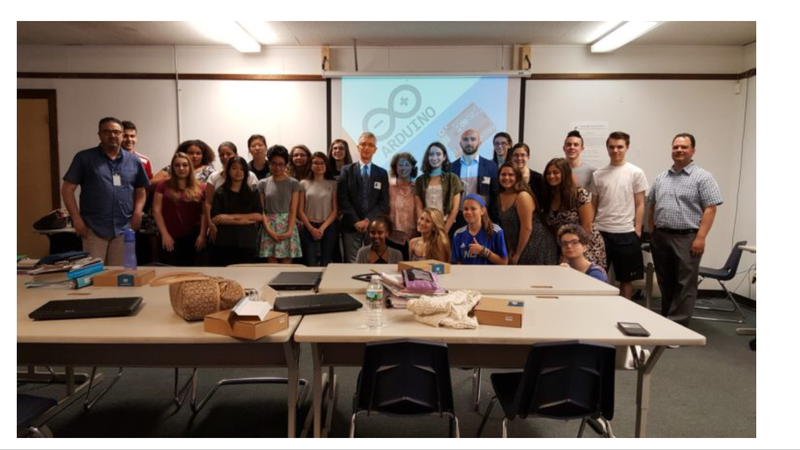 Professor Domenico Savio Teker, Director of the Education Office of the Consulate General of Italy brought to Medford High School an Arduino expert from Italy, Andrea Centorrino to teach Italian students how to use Arduino to create electronics projects. Centorrino is completing his degree in Computer and Telecommunications Engineering at the University of Messina, Italy and is in Boston for his internship at the Italian Consulate. 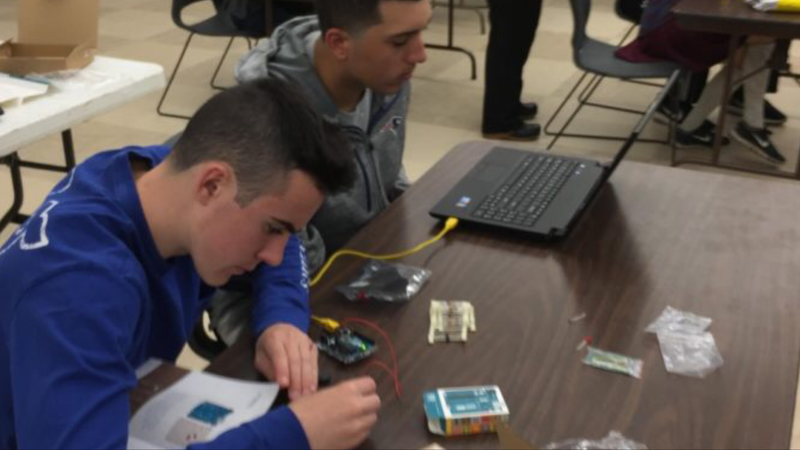 In addition to dealing with a data processing system to speed up the issuing of passports to Italians living in the Boston Area, Centorrino has been going to local high schools to introduce Arduino to students of Italian. Professor SavioTeker and Andrea Centorrino worked with students in Italian IV Honors and Italian V AP. 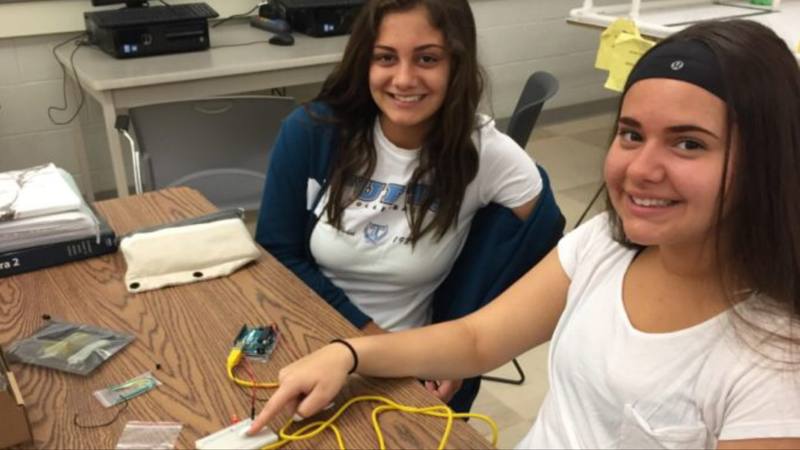 “It was a fun learning experience,” said Natalie Giurleo, “where we incorporated technology and the Italian language to develop our projects.” The comment of another student, Leena Ziane was, “The organizers of the Arduino event were engaging and kind with all the students, and truly sparked a passion for both Italian and learning more about the new technology that continues to develop every day.” For the first lesson, Andrea Centorrino explained to students that Arduino was born in Ivrea, Italy, but originally it got more attention abroad than in Italy. 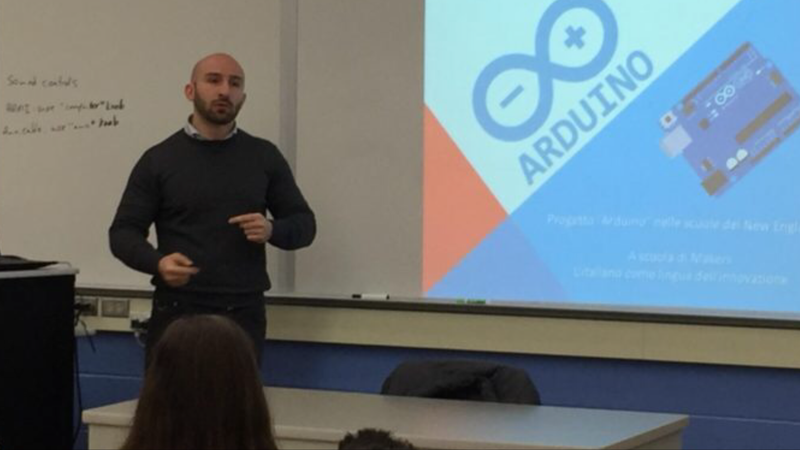 In fact, he mentioned that he first learned about Arduino and then found out that it was made in Italy. Today it is used worldwide. 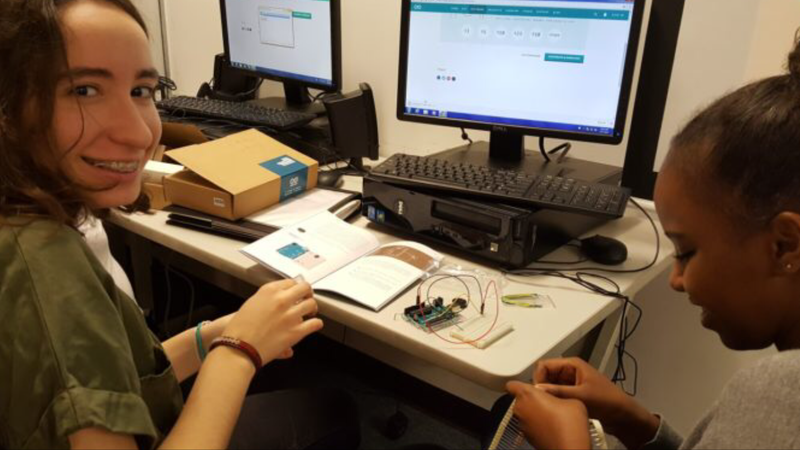 Each student got a free Arduino starter kit, a great opportunity to work with coding and electronics. Centorrino explained to the students that he would show them a few things, and then they could use their imagination, “only the sky is your limit on what you could build with Arduino.” He told them that they could build a project and sell it anywhere in the world, but one needs to remember to give credit to Arduino. 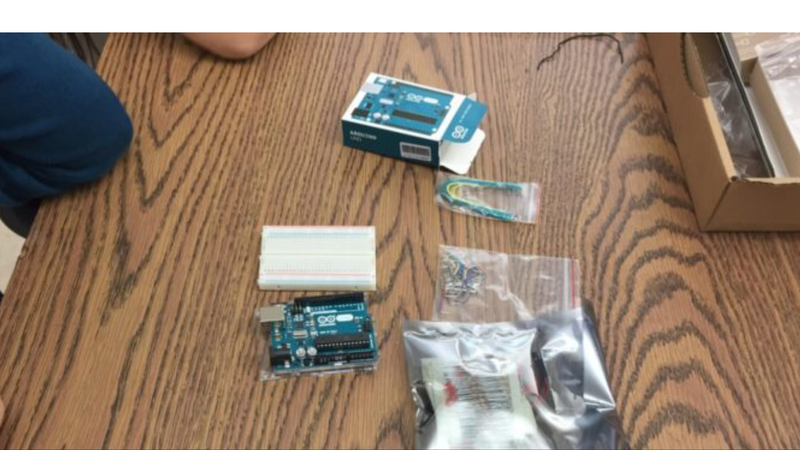 The kits included a project book with directions for 15 projects (written in Italian of course), a USB cable, a Breadboard, push buttons, sensors, LEDs, transistors, resistors, etc. 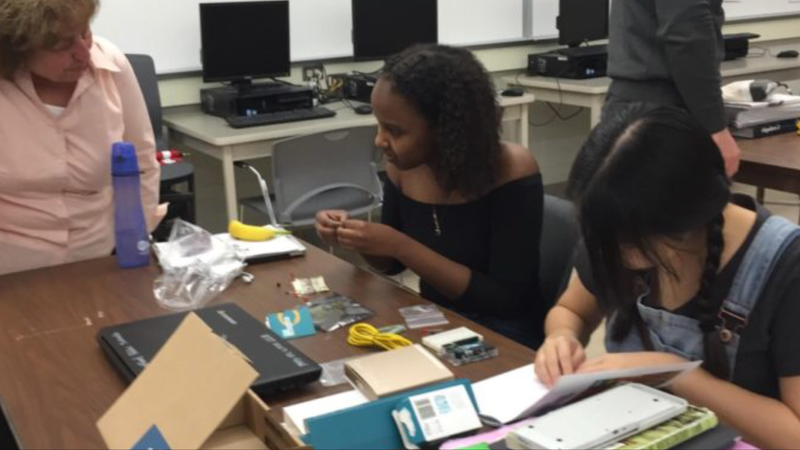 By the end of the first lesson, all students were able to build their Breadboard using buttons, connectors, transistors, resistors… and were able to make an LED light go on with the push of a button. Success! Opening up the Arduino kit. 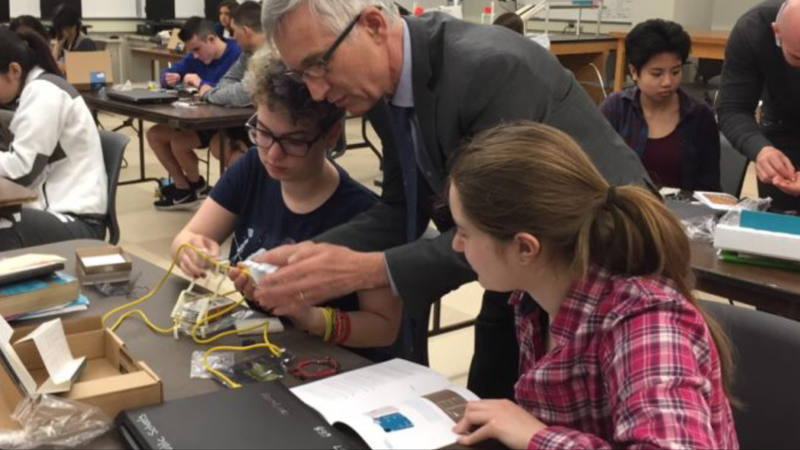 Professor Domenico Savio Teker and Andrea Centorrino returned for a second lesson and the day’s project was to build a Theremin. At the beginning of the lesson no one knew what a Theremin was, but Centorrino explained that it is an electronic musical instrument invented by a Russian inventor, Leon Theremin. He then showed a clip of “The Big Bang Theory” where Sheldon is playing the Theremin, and then students started working on their project. The interesting thing about this instrument is that it is played without any physical contact by the performer.